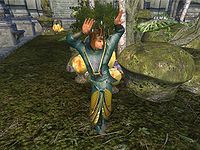 Thadon is the Bosmer Duke of Mania, who plays an important role in the Main Quest. He resides in the House of Mania in the New Sheoth Palace District. A true Maniac, he lives a life of ease and frivolity, full of merriment and joy. He likes to dance, sing and paint. 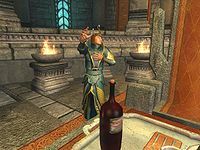 He is also very familiar with drugs, specifically Greenmote, Felldew and alcohol. Apparently this hobby has made him absent-minded, leading some to doubt whether he can cope with his position as Duke. 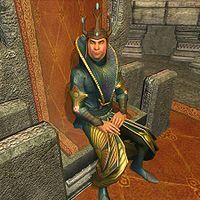 Sheogorath himself will tell you about him: "The long-reigning Duke of Mania. A Master of Merriment, if you will. Or if you won't; I suspect it wouldn't matter to him." It is rumored he's had an affair with his counterpart: Syl, the Duchess of Dementia. 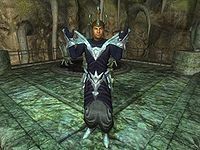 Thadon wears a unique enchanted light helmet, the Diadem of Euphoria, and a unique, unlootable robe. He carries a respawnable Cheese Wedge, a paint brush, a copy of From Frog to Man, and the key to the House of Mania. He wakes up at 6am in the morning to dance for three hours in his garden, the Halcyon Conservatory. After his dance lesson, he will paint for a long six hours, from 9am to 3pm. After that, he will be found reading on his throne in the House of Mania until 7pm. 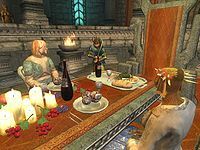 He will wait to eat until 8pm, when he will make up for skipping breakfast and lunch by having a long, four hour dinner with his steward, Wide-Eye, and his chef, Gundlar. At 12am he heads to bed in his quarters. "Someone new comes to the Isles. Much more interesting than someone old." "Gatekeeper's gone. For good. Or not. Might just be on holiday. We'll see." "The Resonator sings its sweet song once more. Promises of riches and fame, fulfilled with death and madness. How delightful." "The Chalice is once again in its rightful place. And places are rightfully mine. And Chalices. Right?" "My, my, my. Seems we're all anxious to know something, even if we already know it. Or, Syl knows it. Or not." "A torch is lit. The light is lighted. Or lit. It's a Great Torch. Much better than most." Addiction: Return the Chalice of Reversal to Thadon, the Duke of Mania. Understanding Madness: Meet the Duke of Mania and the Duchess of Dementia and join their courts. Ritual of Accession: Become a Duke/Duchess in the Court of Madness. Ritual of Mania: Kill the Duke of Mania and take his place. The Roots of Madness: Cleanse the Pools of Madness. "You haven't waited long at all." "Haven't I? Hmm, perhaps not. It felt like rather a long time, but then long times get longer when you're standing around thinking about them. A curious thing, that. Long roads get longer too, if you're thinking about them, but what about long words? They don't change nearly as much. Long, short -- it all ends up the same. Dust and tears. Usually tears first, then the dust. Dust can't cry, you see. That would be... well, amusing. You know what's NOT amusing? I don't have my Chalice of Reversal. It makes me sad. When I get sad, I don't care to do much of anything. I certainly don't care to help people who show up on my doorstep wanting something. Are we getting the picture here?" "You've been waiting a long time." "Oh, I wouldn't say that. How long is an eon, when you're ten thousand feet tall? Or if you're purple? It's all relative, you see. You wouldn't really know how long it's been, since you weren't here. If you'd been here, it would've been no time at all, so who's to say? Don't answer that. I know the answer. I knew far more answers once, but they seem to have dried up. Or perhaps they drowned. I don't know anymore. You see? You see what I have to deal with? I can't recall if I'm coming or you're going without the Chalice of Reversal. Oh, now you've upset me." "Yes, yes... That just might be true. Or I've not been waiting at all. Forever and nothing are almost the same thing, wouldn't you say? How do you tell one from another if you're smack in the middle? Don't answer that, I already know the answer of course. It came to me during a meal. Not a very good meal, though. Too much pie. Pie is a tricky thing, wouldn't you say? Don't answer that either. Now that forever is over and you're here, you need to go away. Yes, away. There are places you should be, far away from here. The Chalice of Reversal is waiting for you. When I say you, I mean me, but it's no difference to the Chalice. One ends up being the other." "Don't I? I thought I did. But then I also thought that you would be heavier. Look at you, you're light as a chair. How DO you walk around like that? It's all the same to me, either way. All of it. Nothing is right without the Chalice. Have you ever used it? No, of course not. You simply must! You just have to try it. It'll change your world, expand your horizons. Contracting leads to expanding, you know. Well, most of the time." "Don't you? If you don't, you might. You wouldn't fall for her, though. Not the type." "Well, aren't you the clever one. Mind you don't get too full of yourself. You might explode." When you ask him what happened, he will tell you:"Opposites repel, strangely enough. All that pleasure and pain locked away now, as if it never happened. Unfortunately, the Chalice is locked away as well. I have no wish to retrieve it myself, but fetching it might do you some good. My head is positively throbbing now... can you see it? I need to lie down. Find someone to tell you the rest of the story. Get the Chalice." Talking to him again will make him ponder: "Didn't we have this conversation already? Or was that someone else... No, it was me. And you. And so you know what you should be doing right now. The Chalice, remember? Don't forget, because if I forget then no one will remember, and it might cease to exist. Reality is fickle like that." If you ask about the chalice again, you'll cause him confusion again: "I feel as though we've talked about this. Am I mistaken? Perhaps you're mistaken, and we have spoken of it. I simply can't recall. I could think so much more clearly if I had the Chalice." You may also be working on the concurrent quest, The Lady of Paranoia, and will discover that the conspiracy centers around the fact Thadon has been "passionate" with Lady Syl. Ma'zaddha will tell you about it: "She and Thadon... they've been meeting in secret. They've been doing things together. Consorting. You understand me?" If you confront Thadon about the conspiracy, all he will say is: "Oh, no. You'll not drag me into Syl's mess. She made this bed, now it's up to her to burn it." After having consumed Felldew, Thadon may make a remark upon seeing you in your state: "Oh my. Look at you. You're in the thick of it now, aren't you?" When you return with the Chalice, however, he may make a different remark upon seeing you: "Alive and kicking, are you? Welcome back." He will be overjoyed upon greeting you: "The triumphant champion returns! So, do you feel any different? Now that you've been through this experience, I mean. You know what it's like now... Always wanting that next fix, hating it but craving it at the same time, and hating yourself for all of it. Ah, well. All over now. The Chalice helps, doesn't it? Indeed it does, and I could use some helping right now. I'll just take that back from you. And as a token of my gratitude, I grant you the role of Courtier of Mania, with all of its entitlements. Which is to say, none." If you choose to become Duke/Duchess of Mania, you're going to have to get rid of Thadon through the Ritual of Mania. Instead of murdering him in cold blood, you are to give him an overdose of Greenmote, for you need the blood from his exploded heart to satisfy the ritual. This is a mission that will put your stealth to the test: you won't have anything worse to fear than gaining a bounty. 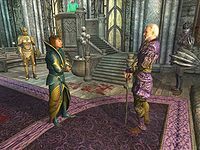 Sheogorath himself will tell you it's a safer choice than having to kill Syl: "A safer choice, perhaps. Maybe you'll live through this. Thadon's a bit lost these days. Not that it's a bad thing. It suits him. Until now. Besides, won't it be a grand surprise when you make his heart burst from too much Greenmote? Thadon loves surprises!" He will give some additional information if you ask him: "Thadon may be in a constant state of euphoria, but I wouldn't underestimate his intelligence. Oh, this is so much fun!" Throughout the whole ordeal, Thadon won't have time to talk to you, as he will remark upon greeting you: "Ah, you again! A pleasure, I'm sure. No time for chatter now; I have a few important things to attend to, or did I? Ah well..."
In order to find Greenmote, you're going to have to talk to his steward, Wide-Eye. If you greet her after having been pointed to her, she'll suspect you've been talking to Thadon: "You've been speaking to Thadon. I can tell. He has a certain... effect on people." She will give you her opinion of Thadon: "Such a kind and noble man. In times like these, it's good to have a leader who still enjoys all the modern pleasures Mania has to offer." If you ask her about her routine with a disposition of less than 60, she will prove uncooperative: "Thadon has too many enemies that may turn that knowledge against him. He depends on me quite dearly." Raise her disposition though, and she will give some specific information about Thadon's evenings: "Around 8 p.m., we are served dinner. Gundlar is quite a chef and prepares Thadon's meals personally, adding just a hint of Greenmote. After that, we dance, we sing, or we do whatever else suits my lord's tastes." "Oh my yes, I feel especially delighted this evening! Perhaps it's time I recited my latest soliloquy. Ahem. The lady fair, our love is told. With hair as fine as soft-spun gold. Lips as red as a sun-drenched dawn, skin as soft as a newborn fawn. After that, he will drop dead as his heart bursts, leaving you to gather his blood. Wide-Eye will cry over Thadon's death, but will try to accept what has happened upon greeting you: "I never suspected it was Thadon's time, but what's done is done. I honor his choice." Gundlar will be happy however, raising his arms in enjoyment: "There's no need to mourn. The Ritual has begun! Be happy!" Thadon: "Wait! I must speak! Halt! Cease! Desist!" 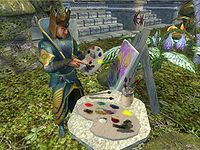 Sheogorath: "Thadon, how dare you interrupt me! Only I interrupt me. Like just then. I'm speaking with someone. We'll talk later. Or not. When is later, exactly? Not now, I'm sure of that. Guards, I think Thadon forgot how to use the door. Kindly show him out. Before I forget myself." "Syl... my... Syl is dead? This can't be right. Is this right? What have you done? Have you done this?" "Hold your tongue, little Duke, or I'll tear it from your mouth." "But, this... stranger? Someone new? From somewhere else? Not here. I'm sure of that. I don't understand. Or I can't." "Calm yourself, Thadon. You're making my teeth itch. You still hold your office. I suggest you see to your duties." "Ridiculous! You can't do this! Although... you're omnipotent. Or just tall. It's one of the two, I'm sure. And a fool!" "Fool? Visionary! Change is in the air, Thadon. Breathe it deep! Bathe in its scent! Bottle it up. Save some for later." "Order approaches! It's taken the Fringe already! With Order clothes and Order hats! And you speak of "change"?" "Change will preserve us! It is the lifeblood of the Isles. It will move mountains! It will mount movements!" "No. No. Certainly not. This isn't good. I'm sure it's bad. I can't do this anymore. No more." "Then go, Thadon. Have your Greenmote. Take a bath. But leave. Before I decorate my throne with your insides." "Yes. That's it. I'll go. Away. Far away. Working for them is like working for us, but without all the dying." "Enough! I go to Jyggalag. I give myself to him, as a Priest of Order! This isn't done, Madgod. I think it's just started." After the dispute, Thadon will leave the Sacellum and the Madgod will comment: "Wondering why I let him go, aren't you? I can see it in your face. Mostly in the eyes. I may take those from you when this is done. This has never happened before! The ruler of Mania turning traitor? Unprecedented! But different is good. A new act in this play. Maybe we're on to something here. We'll see how it plays out. It can't be worse than what's happened before." Thadon will then be disabled and will be removed from all of his factions. If you completed the Ritual of Dementia, you will get to see Thadon once more during The Roots of Madness. You'll find him helping Priests of Order contaminate either the Pool of Mania or the Pool of Dementia; he will be found in the second pool you cleanse. As he will now be added to the Forces of Order, he will be wearing an Order Priest's Robe this time, and will be armed with a leveled dagger or shortsword of the highest possible quality of your level, possibly enchanted. He will also carry either another dagger or shortsword of Iron, Steel, or Silver quality depending on your level; or starting from level 6, he will carry a leveled Crystal Staff instead. He will also have two leveled potions, of which one is a healing potion. He will also be able to cast a leveled set of Priest of Order Spells. "You. Of course. Sheogorath's assassin." "I see so clearly now, what a fool I have been. A happy, heedless fool." "How he must have mocked me, with my poems, and my painting, and my meaningless revelry." "But no more. No more!" "If only I had seen it sooner. My beloved Syl might stand here next to me." "Instead, she is dead, at your hand. And Sheogorath's command!" "I hope you enjoyed your reign, as it is almost at an end." "Jyggalag is coming. He cannot be stopped. He will rule this land, and all our delusions will be stripped away." "Now, taste the power of the true Lord of this realm!" He may also attack you if the priests have been killed before he finished his speech. 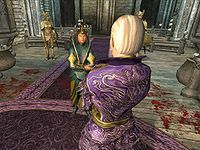 It's possible he will immediately attack upon seeing you saying only the first line of the speech or the following line: "Sheogorath's pet! His/her head will make a fitting ornament for our Lord Jyggalag's throne room!" It is probable any of these happen due to him having a low disposition towards you. "Where is Sheogorath now? He has abandoned you, as he did me." "My Lord Jyggalag will never be turned aside by the likes of you, fool!" "Jyggalag will reward me well for your death!" If you manage to talk to him, be it through using a Charm spell or through a high Sneak skill, he will show some more devotion towards Jyggalag as you talk to him: "Why did you come here? Why do you still do the bidding of that prattling madman? When I bowed the knee to Jyggalag, my eyes were opened. All that had come before - meaningless. Pointless frivolity. My lord Jyggalag has given me clarity, and purpose. Order's time has come. The Greymarch is upon you." He will attack you after this exchange, however. His class is always Priest of Order and he'll always have their set of spells, even before joining the Forces of Order. On occasion, you can see him attempt to talk to his Golden Saint guards, but they respond to him rudely like to any other mortal. Thadon also appears in the story expansion Isle of Madness for Legends as the card Thadon, Duke of Mania. This page was last modified on 11 March 2019, at 19:49.